Herein, CdS quantum dots (QDs) sensitized TiO2 nanowires/nanotubes arrays (CdS–TiO2 NWs/NTs) have been successfully fabricated through an optimized one-step anodization method, followed by successively ion layer adsorption and reaction strategy. The structures of the as-prepared samples were characterized by scanning electrons microscopy, X-ray diffraction and X-ray photoelectron microscopy. Results indicated that TiO2 NWs/NTs were comprised of well-ordered NTs arrays in the bottom and NWs at the mouth of the NTs. CdS QDs were uniformly adhered to the surface of the NWs, as well as inner walls of the NTs. In addition, optical and photoelectronchemical properties of the as-prepared samples were investigated. 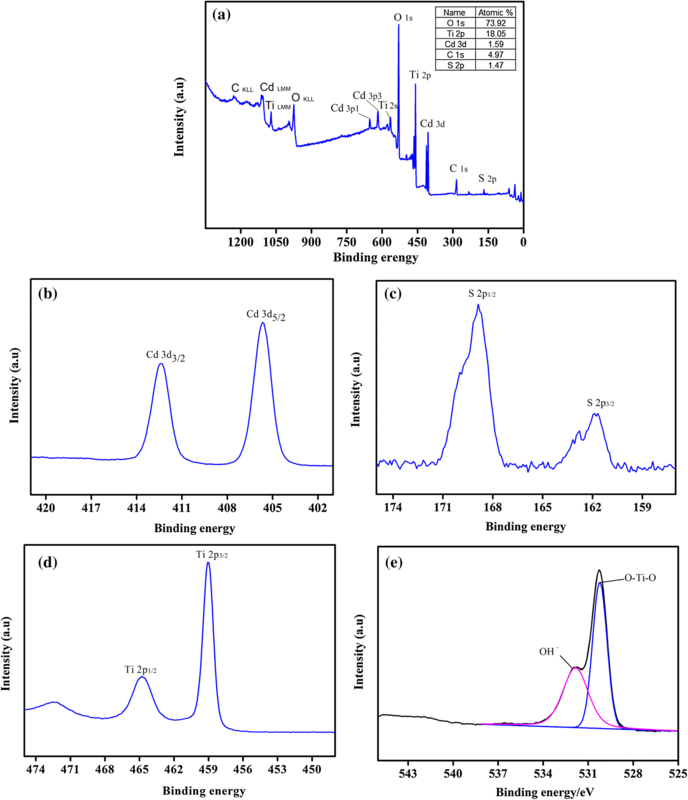 All results showed that CdS–TiO2 NWs/NTs exhibited excellent photoelectric and photocatalytic activities, a photocurrent density of 1.04 mA cm−2, a photocatalytic efficiency of degradation methyl blue of 97.8% after 120 min, and the rate of repeated degradation maintained at 95.8% after 5 cycles. A possible mechanism was described to lay the foundation for future applications. The online version of this article ( https://doi.org/10.1007/s42452-019-0420-9) contains supplementary material, which is available to authorized users. Over the past few decades, Titanium dioxide (TiO2) has been received great attentions and considered as an ideal photocatalyst for solar cells and environmental purification due to its outstanding photoelectrochemical properties [1, 2, 3, 4]. 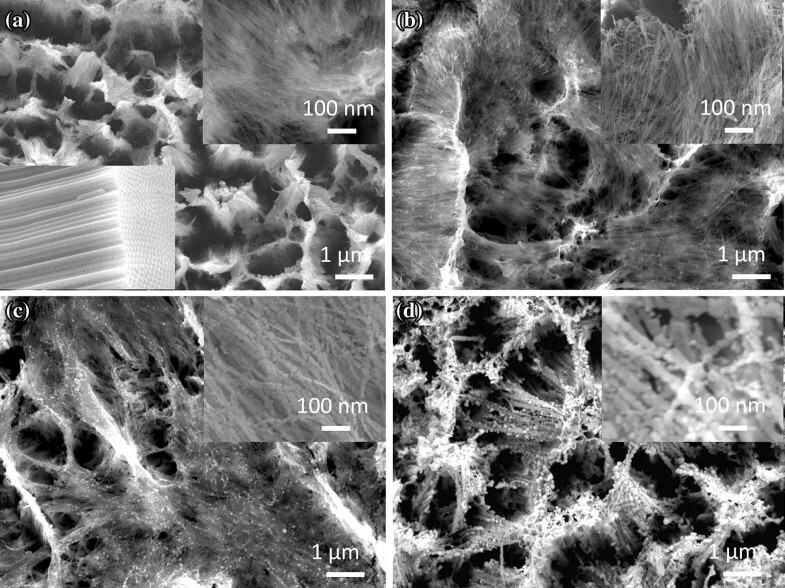 Compared with pulverous TiO2, highly ordered nano-structures like nanowires (NWs), nanobelts (NBs), nanorods (NRs), nanoflakes (NFs) and nanotubes (TNs) have been as more effective architectures to improve the photocatalytic efficiency [5, 6, 7, 8]. 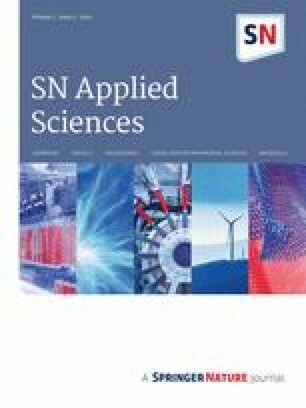 Among these, TiO2 TNs have been regard as the most promising nanostructures for future application with remarkable light-harvesting properties, recyclability and high mass transport efficiency, in which photogenerated carriers can be easily transported along its ordered structures [9, 10]. Actually, enhancing its photocatalytic efficiency for future applications, it requires further enlarging the specific surface area to increase reactive sites and adsorption capacity of the reactants [11, 12]. Usually, the way of increasing the specific surface area is to extend the length of TiO2 TNs, Nevertheless, which would increase the recombination of electron–hole pairs during long distance transmission. Therefore, the challenge of how to further improve the specific surface area of TiO2 NTs with low recombination still remains. Moreover, TiO2 is a wide band gap semiconductor, it can only be excited by UV light, hence, only 2–3% solar energy can be used. Thus, numerous attempts were carried out to narrow this band gap and improve the light absorption capacity in the visible region, such as using non-metallic element doping (N, C, S, I, F) [13, 14, 15], organic dyes or metal chalcogenide quantum dots (QDs) sensitizing [16, 17], depositing noble metal nanoparticles (Au, Ag, Pt) [18, 19, 20], etc. Among these methods, QDs sensitized TiO2 was considered the best strategies to improve spectral absorptivity and electron transfer ability, with a vast amount of studies being reported, these include CdSe, CdS, CdTe, PbS, ZnS, PbSe and InP [21, 22, 23, 24, 25]. In the case of CdS, which has a narrow band gap (2.2 eV), it is a promising material for decorating TiO2, leading to a red shift of light absorption to visible light [26, 27]. By directly loading QDs onto the surface of TiO2 NTs, however, an accumulation at the NTs mouth would occur, which consequently seriously affects the efficiency of photoelectric conversion. To overcome these problems, this work discovered a facile and effective synthetic strategy for the fabrication of a novel composite structure of TiO2 NWs/NTs with CdS QDs, resulting in excellent photocatalysis and photoelectronic properties. In TiO2 NWs/NTs structures, highly ordered NTs arrays were prepared on a Ti film, NWs were generated through splitting of the top of the NTs, which meaned that the NWs and the NTs was an organic whole. This unique structure is not only beneficial to utilizing the advantages of TiO2 NTs in efficiently transporting the photogenerated carriers, but also to increasing the specific surface area of TiO2 for loading additional QDs. The SILAR method was then used to synthesize CdS QDs to adhere to the TiO2 composite structure. The results showed that the compound possesses excellent photoelectrical performance and photocatalytic efficiency as well as high reusability rate. The TiO2 NWs/NTs arrays were fabricated using the anodic oxidation method. In a typical experiment, Tailored Ti foil (99.6% pure, 1 cm × 1 cm × 0.02 cm) was successively ultrasonic cleaned by acetone, isopropanol, ethanol and distilled water. Then the cleaned Ti foil was polished in a mixed solution of hydrofluoric acid and nitric acid for 30 s. The anodic oxidation process was conducted in ethylene glycol solution (include 0.3 wt% NH4F and 2 vol% H2O) by 55 V DC power for 5 h. The as-anodized Ti foil was cleaned by distilled water several times and then annealed in a muffle furnace at 500 °C in atmosphere for 3 h with a heating rate of 5 °C/min. In SILAR process, the prepared TiO2 NWs/NTs arrays were successively dipped into ethanol + 0.1 M CdCl2 and methanol + 0.1 M Na2S for 5 min each time, respectively. After one immersion procedure, the sample was washed with ethanol and methanol to remove excess reagent, and then dried before entering the next dipping cycle. After this process, the prepared sample was annealed at 350 °C for 1 h in vacuum to obtain a more stable heterojunction. The prepared samples were respectively called CTWT0, CTWT1, CTWT2 and so on, according to the number of SILAR deposition cycles. Crystal structure of the samples were characterized by X-ray diffraction (Shimadzu, XRD-6100) with Cu Kα irradiation (λ = 0.15418 nm) at a scanning rate of 4° min−1 in the range of 20° ≤ 2θ ≤ 80°. The surface morphology and the elemental concentration and distribution were analyzed by an energy dispersive spectrometer (EDS) attached to the field emission scanning electron microscopy (JSM-7800 FESEM). The chemical composition and electronic structure were determined through X-ray photoelectron spectroscopy (XPS, ESCALAB 250XI) using Al Kα (hν = 1486.6 eV) irradiation with the electron energy analyzer operating at constant transmission energy (30 eV) and the measurement was performed under ultrahigh vacuum conditions 10−10 Torr. The UV–Vis absorption spectra were measured by a UV–visible spectrophotometer (Hitachi, U-3310). Photoluminescence measurements were performed on a fluorescence spectrophotometer (Hitachi, F-7000) using Xe lamp as excitation source. The photoelectric behaviors were characterized using CHI 760E electrochemical workstation, a 300 W Xe lamp was used as the simulated solar light source, 0.5 mol L−1 Na2SO4 solution was used as electrolyte, whereas Pt foil and saturated Ag/AgCl were used as counter and reference electrodes, respectively. The current–voltage characteristics was tested from open circuit voltage to 1 V at a scan rate of 0.05 V s−1, and the transient current–time characteristics was measured at a bias voltage of 0.6 V for 380 s with an interval of 20 s between dark and light. To detect the photocatalytic efficiency of the prepared samples, 30 mL MB solution (5 mg L−1) was used as the contaminant in the photocatalytic test process, and this process was conducted under the same Xe lamp light source at room temperature. Figure 1 shows the FESEM images of TiO2 NWs/NTs arrays with different deposition times of CdS through SILAR method. As shown in Fig. 1a, the bare TiO2 NWs/NTs is comprised of well-ordered NTs structures in the bottom with an average diameter of 80 nm, TiO2 NTs wall thickness is ca. 10 nm, and the orderly growth of NWs at the mouth of the NTs. NWs diameter is ca. 3–5 nm and ca. 1–2 μm in length, as shown in the insert image (the upper-left corner is the magnification of the top of NMs, the bottom-right is the magnification of the bottom of NTs). The anodic oxidation process can be believed that the TiO2 NTs were firstly formed at the film of Ti foil, and then the mouth of NTs would be split into NWs with increasing electrolytic time, resulting a combined structure covered well-arranged NTs in the bottom and NWs in the top. Undoubtedly, the electrolytic voltage and electrolysis time is the key to generating a good NWs/NTs structure. Many reports have indicated that only TiO2 NTs can be obtained at 20–30 V electrolytic voltage [28, 29]. Similarly, experiments have shown that NTs were obtained within 3 h of electrolysis, in which all wires were without any NTs after electrolysis for 7 h owing to the excessive anodic oxidation time (show in Fig. S1). Herein, the anodic oxidation condition was controlled at 55 V for 5 h. Compared with other reports, our approach can simplify the operation process (one-step composition) and greatly shorten the reaction time . Figure 1b shows the top view of CTWT1, only a small amount of QDs was deposited on TiO2 NWs/NTs arrays due to the SILAR cycle time being too small. By increasing the number of SLAR cycles, the quantity of CdS QDs expanded greatly, as shown in Fig. 1c. From the insert diagram, it can be seen that CdS QDs were displayed a spherical structures particle with an average diameter of 6–8 nm and uniformly adhered on the surface of NWs. However, with an increase in the number of cycles, QDs aggregation easily occurred on the surface of NWs/NTs, as shown in Fig. 1d, the surface of NWs were covered with a thick layer of QDs. The results indicate that the SILAR is an effective way of depositing CdS QDs on TiO2 NWs/NTs, with the QDs uniformly adhering to the NWs and inner wall of NTs. When compared to the NTs structure, this unique structure can provide greater surface area for more QDs deposited on their face, which can enhance photon absorption ability and improve photoresponse efficiency. The crystal structures of the as-prepared samples were characterized and the XRD results were shown in Fig. 2a. In the case of bare TiO2 NWs/NTs arrays (Fig. 2a(1)), all diffraction peaks are attributed to anatase TiO2 (JCPDS No.89-4921) and Ti substrates (JCPDS No. 89-5009), respectively. As shown on the Fig. 2a(2–4), the weak diffraction peaks at 26.5°, 43.9°, 52.1° correspond to the (111), (220), (311) crystal plane of CdS QDs (JCPDS No. 75-1546), the other CdS diffraction peaks were not identified due to overlapping with anatase TiO2 and Ti substrate peaks . The XRD patterns indicated that these composite materials consist of CdS, TiO2 and Ti, which showed that CdS QDs were successfully deposited on the TiO2 NWs/NTs arrays. The EDS spectra of the sample CTWT3 displays the distribution of the atomic and weight composition, as shown in Fig. 2b, and the presence of Ti, O, Cd, S, C elements, which is consistent with the XRD and FESEM results. Furthermore, the ratio of atomic composition of Cd:S is close to 1:1, demonstrating that the prepared QDs are without other impurities, and that the ratio of Ti:O is more than 1:2 attributing to the surplus O absorbed by the sample. In addition, there is an intense peak from C element, which may be the consequence of C absorption from the air or the stained ethylene glycol be carbonized during the annealing process . To conduct a detail investigation of the chemical components and electronic structure of the CTWT3 sample, XPS analytical technique was performed. The analysis of XPS spectra was preceded using XPSPEAK 4.1 software and the peak positions of core level spectra were calibrated with C 1s at 284.6 eV . Survey spectra of the sample was shown in Fig. 3a, where all of core level spectra of the element such as Ti, O, Cd, C and S were existed without impurity. From the insert table, it can be seen that atomic ratio of sulfur to cadmium is about 1:1, and carbon and excess oxygen may be due to the contamination of the sample exposed to the air. As shown in Fig. 3b, the binding energy of Cd 3d is located at 405.7 and 412.4 eV individually, due to Cd 3d5/2 and Cd 3d3/2 of CdS QDs. The binding energy of S 2p is at 161.8 and 168.8 eV (Fig. 3c), which demonstrates the presence of the S element in the samples, with S2− valence state. From Fig. 3d, the energy located at 459.0 and 464.8 eV corresponds to Ti 2p3/2 and Ti 2p1/2. Additionally, O1s is observed at 528.2–535.3 eV, the peaks at 530.22 and 531.8 eV can be assigned to the O–Ti–O bond and hydroxyl oxygen (OH−), respectively, which mainly originate from air. The results were consistent with the EDS patterns, which further confirmed that CdS QDs have been successfully deposited on TiO2 NWs/NTs arrays. The UV–Vis absorption spectra of the CTWT0 and CTWT3 samples are shown in Fig. 4a with a wavelength range 300–760 nm. We observed that the bare TiO2 NWs/NTs arrays could only absorb UV light below 380 nm, when those sensitized using CdS QDs (Fig. 4a(2)) were examined the absorption peak position of TiO2 showed a large red shift extending to 520 nm, which indicates that the sensitization of CdS QDs can significantly enhance the photoresponse range of TiO2. Figure 4b shows the PL spectra of the CTWT0 and CTWT3 sample, with a 260 nm excitation wavelength. The two spectra display identical forms, exhibiting the main character of TiO2 in PL generation. The main peak at 365 nm can be attributed to the direct recombination of electrons and holes in TiO2, and the weak peak at 467 nm may be assigned to be the following reasons: the oxygen and impurity defects induced photoluminescence; and the surface states induced photoluminescence at the annealing temperature . Vitally, PL intensity of CTWT3 is lower than that of CTWT0, indicating that TiO2 can reduce the electron–hole pairs recombination after being deposited on CdS QDs, which contributes to the improvement of the photoelectric performance and photocatalytic activity. The current–voltage characteristics of the as-prepared samples are shown in Fig. 5a, the photocurrent density increases with increasing applied potential and photocurrent value of the CdS QDs sensitized sample, which is higher than that of bare TiO2 NWs/NTs arrays. This result indicates that CdS is suited for the sensitization of TiO2 NWs/NTs arrays. In the case CdS QDs sensitized samples, the current intensity increased with increasing number of SILAR cycles, in which the maximum value is obtained from the product after 3 cycles. Moreover, the photocurrent onset shifts from − 0.111 V (bare) to − 0.49 V (CTWT3), which is attribute to a shift in the Fermi level to a more negative potential, resulting a better charge separation and electron accumulation . Figure 5b shows the transient current–time characteristics of the as-prepared samples. A maximum 10% drop down is observed in the whole light process, indicating excellent charge transmission and strong photo stability. At 0.6 V applied potential, the stable photocurrent density of the four samples is 0.375, 0.598, 1.040 and 0.755 mA cm−2, respectively, which shows that those sensitized with CdS QDs are higher than pure TiO2 NWs/NTS arrays. The highest obtained value is ca. 1.040 mA cm−2, which is ca. 2.8 fold greater than the bare sample (0.375 mA cm−2). Moreover, when the number of SILAR cycles is increased by 5 times, the corresponding photocurrent density decrease to 0.755 mA cm−2, which is as a result of over surplus dense of the CdS QDs. From the insert imagine of Fig. 1d, QDs were completely wrapped around the TiO2 NWs/NTS structures and plied arsy-varsy on their surface, which would increase the interface between QDs and hinder charge transfer, hence a decline in photoelectric properties is observed . where C0 and Ct are the concentration of MB at irradiation time 0 and t, A0 and At are the absorbance intensity at the wavelength of 663 nm at time 0 and t, respectively. As shown in Fig. 6a, 51.8% of MB solution was degraded by the bare TiO2 NWs/NTs arrays after irradiation for 120 min, which is higher than those previously reported , and may attribute to this special composite nanostructure with more reactive sites on their surface. Furthermore, the photodegradation efficiency was increased with the increasing number of SILAR cycles, resulting in the highest degradation rate of 97.8% after 2 h, which is also higher than the same work. Additionally, the absorption spectra of the residual MB solution after degrading by CTWT3 with different time, showing the insert imagine of Fig. 6a. As the intensity of the absorption peak gradually declined, with a decrease of pollutant concentration, the intensity was almost reduced to zero after 120 min. Meanwhile, the stability of for degrading MB solution was also examined (Fig. 6b), the degradation efficiency was rather stable and the degradation rate was ca. 95.8% after 5 identical tests. This result indicated that the sample displays outstanding properties of stability and reliability for catalyzing the degradation organic pollutants . Summarily, its excellent optoelectronic performance and photocatalytic activity of the prepared sample may be attributed to their excellent structure: CdS QDs possesses a narrow band gap, allowing the absorption spectrum of sensitized TiO2 to be extended into the visible light region; Nanowires will not only improve the surface area for increasing more reactive sites but also accommodate more QDs, compared with the usual TiO2 NTs arrays; The QDs deposited on the wall of the tube enable the light to form effective refraction and improve the utilization rate of light; NWs are grown in situ at the mouth of the NTs and closely connect between NWs and NTs, the excited electrons can be rapidly transported along NWs to vertical NTs, reducing the probability of recombination of electron–hole pairs. A new nanostructure of CdS QDs deposited TiO2 NWs/NTs arrays were successfully fabricated by the anodic oxidation and SILAR cycle process. In this structure, NWs integrated with NTs can enlarge the surface areas for depositing more quantum dots and quickly transport electron to vertical NTs, enhancing the efficiency of photoelectric conversion. Therefore, the as-prepared samples showed an enhancement absorption of visible light, exhibiting an excellent photoelectric and photocatalytic properties. Meanwhile, this structure could be modified by other sensibilizers to further improve their performance and we will also carry out research on this issue. Thus, we believe this strategy of synthetically utilizing the advantages of TiO2 may provide a prospect for practical application in solar energy and environmental protection. This study was funded by the Fundamental Research Funds for the Central Universities Key Project (XDJK2017B062) and the National Science Foundation for Young Scientists of China (Grant No. 51605392).